The bright lights of these big cities are beckoning you to find a new job. Are your career aspirations as big as a city skyscraper? They should be. Big cities offer bright opportunities to find good jobs, as the latest Monster data shows. Using data provided by the TalentNeuron tool from insights and technology company CEB, we identified the top cities with the most job postings on Monster in 2017. It must be true what they say about everything being bigger in Texas—at least, it’s true of your odds of finding a job. Houston nabs the top spot, with Dallas (3) and San Antonio (6) sitting high on the list. New York City comes in second place, proving that it’s not a matter of if you can make it here, but rather how you’re going to make it here, considering there are so many big opportunities available in the Big Apple. Atlanta (4) and Chicago (5) round out the top five (sorry, we couldn’t think of any clichés for those cities). 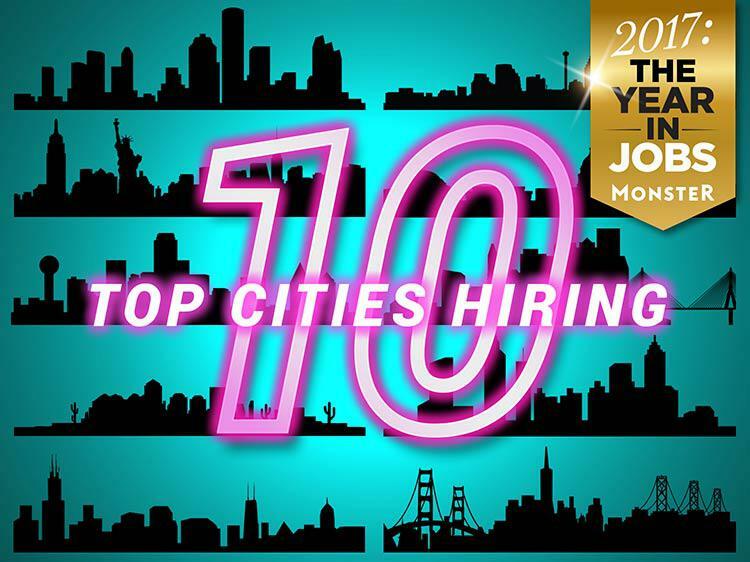 Check out the full list below to see which cities have the most listings for jobs on Monster—and then see the top jobs they’re hiring for. Houston tops our list of the best places to find a job because of its high volume of job listings based in the area on Monster this past year. But don’t just take our word for it—data from the Bureau of Labor Statistics supports our finding that this is a great city for job seekers. According to BLS data, workers here typically find employment in trade, transportation, and utilities as well as professional and business services and the government. Find all jobs in Houston on Monster. Big opportunities are abound in the Big Apple. Following closely behind Houston in terms of job growth, many New Yorkers find employment in education and health services and professional and business services, according to BLS data, while Monster data shows that some of the top jobs hiring now can be found in tech. Additionally, average hourly wages are a lot higher than the national average at $29.71 per hour, but it’s important to remember the city also boasts a higher cost of living at about 129% higher than the national average. Find all jobs in New York City on Monster. Texas must be where the jobs are, as this north Texas city is the second of three in the state to make our list. Not only can Dallas boast jobs in trade, transportation, utilities, and professional and business services, per BLS data, but also the city’s unemployment rate is lower than the national average at 3.8%. Find all jobs in Dallas on Monster. Could Atlanta be the new tech hub in 2018? Monster data shows the city is definitely on its way, as the top jobs on Monster can be found in the technology sector. Additionally, other job-creating sectors, according to the BLS, include trade, transportation, and utilities and professional and business services. Find all jobs in Atlanta on Monster. The winds are blowing in the job seeker’s favor in this city. According to BLS data, the sectors with the most jobs include trade, transportation, and utilities, professional and business services, and education and health services. Not to mention, employment in financial activities has increased significantly year-over-year. Find all jobs in Chicago on Monster. Of all the cities on our list, San Antonio experienced the biggest year-over-year increase in employment from 2016 to 2017, with jobs increasing by 2.9%, according to the BLS. Their data shows that much of this great job growth can be found in trade, transportation, and utilities, government, and education and health services. Find all jobs in San Antonio on Monster. Tech is governing the job market in Washington, D.C., according to the top jobs on Monster. Transportation is also a major job-creator here, as Monster data shows that Washington Metropolitan Area Transit Authority did the most hiring in 2017. The nation’s capital also boasts a low unemployment rate of 3.9%, lower than the 4.1% national average, according to the BLS. Average hourly wages are also up, with workers typically making $32.69 per hour, but again, it’s important to remember the cost of living, while not as high as other cities on our list, is still about 40% higher than the national average. Find all jobs in Washington, DC on Monster. With best-in-class hospitals like Massachusetts General Hospital and top-rated universities, including Massachusetts Institute of Technology and Harvard University, it’s no wonder BLS data finds education and health services to be the largest jobs sector in the Boston area. Not to mention, the city boasts a low unemployment rate of 3.1% and high average hourly wages totaling $30.81. Find all jobs in Boston on Monster. Arizona isn’t just home to the Grand Canyon—it’s also home to grand opportunities for jobs in its capital city. In Phoenix, Monster data shows that you can find many jobs in health care, especially at top employers UnitedHealth Group and IASIS Healthcare. Other job-creating sectors include trade, transportation, and utilities and professional and business services, according to the BLS. Find all jobs in Phoenix on Monster. While Monster data heavily supports the tech-driven labor market in San Francisco, BLS data shows that construction jobs are also on the rise in the Bay Area. At 3.8%, the unemployment rate is lower than the 4.1% national average, while average hourly wages are greater than the national average. San Francisco workers typically earn $33.23 per hour, but the cost of living, especially housing prices, can be very pricey here. Find all jobs in San Francisco on Monster.